My friends placed orders as soon as they witnessed me eating and relaxing at our get-togethers handsfree, while they all struggled with one arm wrapped around baby, the other chasing food around a plate. I used the prototype on a flight to Greece and the whole experience was so much more enjoyable as I could read and entertain my daughter throughout using both hands! Mums and grandparents are always approaching me in restaurants asking where they can buy one…..my husbands ‘eureka’ moment was when he realised he could use it to play the Xbox! 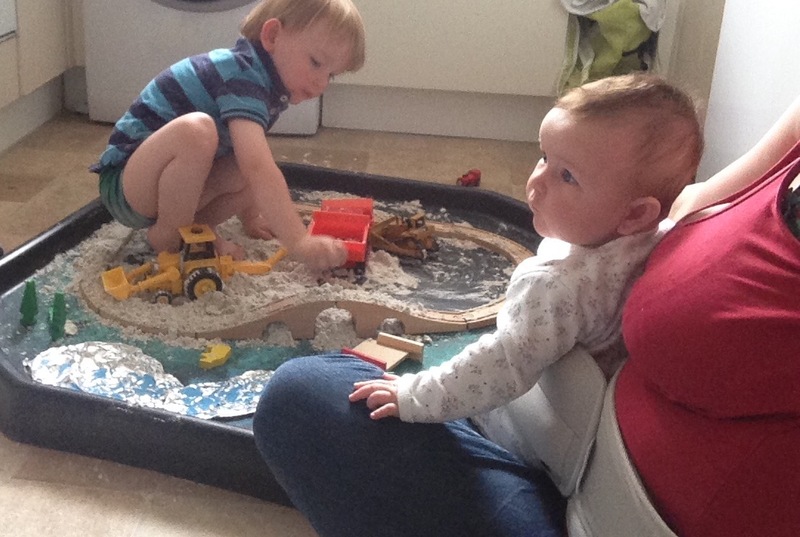 Now a mum of two, she gets approached restaurants by parents and grandparents asking where they can buy one. In it’s most basic form, the LapBaby is a lap belt. But its more than that. 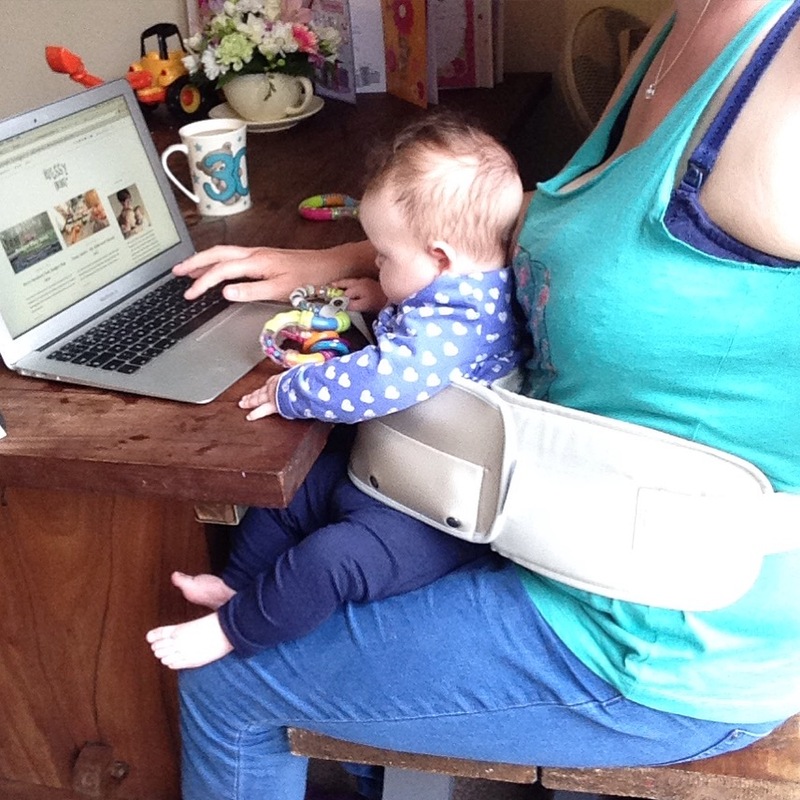 The LapBaby enables you to you to still do all of the sitting down things you need to do, without losing the use of one arm to holding a baby that just wants to be close to you or be involved in whats going on around them. To use, you simply click the belt around your waist. Open the front part of the the LapBaby and sit your baby on your lap. You then wrap the front around the baby’s waist and stick to the velcro panel before securing with the buckle. Et Voila! 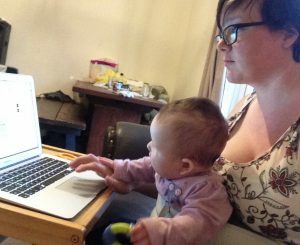 Your baby can then sit with you and enjoy the closeness while you are still able to eat, type, play with your other children, read to them, enjoy sensory play together and a million other things. It can even be used for travel on planes and trains. It comes in a handy carry pouch and stores easily. 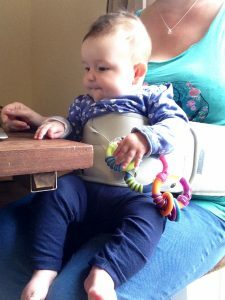 It’s small enough to take everywhere either under your buggy or in your changing bag but big enough that it doesn’t dig in or slip down when in use. It’s very easy to put on and takes about 20/30 seconds. I’ve had this product for around a month and I’m completely sold by it. Even Liam is impressed and can be quoted as saying it is a product he believes in. Our main use has been at dinner time so far as thats when we are all together and Paisley of course wants to be part of that. Before the LapBaby, we used to take turns to hold Paisley while one of us would cut the others food in to fork sized pieces. Having her on our laps (yes, Liam’s used it too) has made such a difference to meal times. The four of us are all able to sit together and enjoy dinner without Paisley crying to be held or one of us struggling. I’ve also used it when writing blog posts as it is so much easier to use than trying to type with one hand or give up and put the laptop away and I’ve even used it sat on the floor with Dexter during some of our messy play activities which is great for him as it means his sister isn’t keeping me from spending time with him. In around a months time we are looking at starting to wean Paisley and I see this becoming very well used during that time. Especially as it comes with a hidden lap cover to avoid spills and dribbles. The cover is folded up inside the front of the baby belt part and is attached by poppers so that you can take it off to clean it. Another feature that Paisley is particularly a fan of is the toy clip. Again, very simply designed, its just a small tag with a popper at the end that can be used to secure toys, dummies, teethers and beakers which means that you aren’t constantly having to bend down to pick things up when your baby starts to enjoy dropping things on purpose. 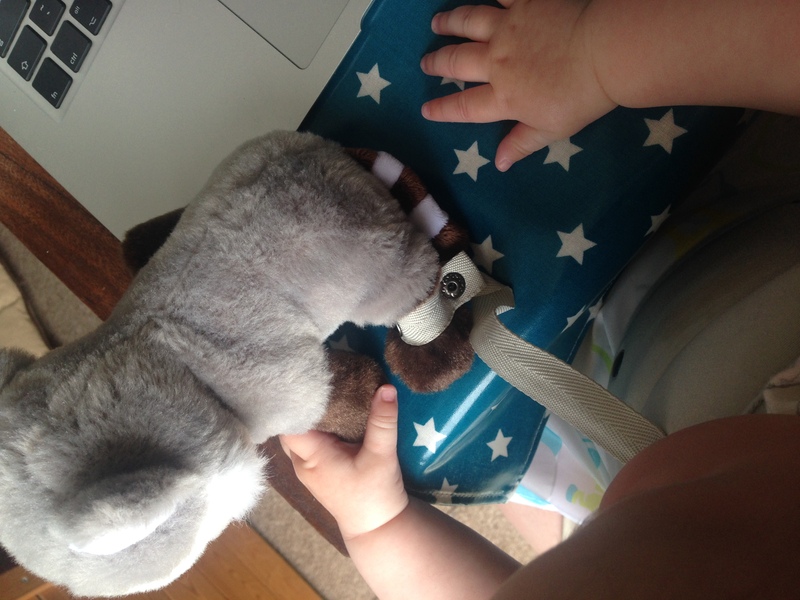 The Lap Baby retails at £24.99 and is available here. It is suitable for babies that can hold their heads up so on average from 3 months old. It’s free from harmful chemicals and allergens. You can find LapBaby across social media on twitter, facebook, instagram and pinterest. Yes! It would’ve been marvelous to have this with my first too! It’s come in very handy so far!